The Strike Line charging cable delivers power quickly. Scosche Industries unfurled its first line of USB-C to Lightning power cables, which will bring a 1-2 data-power punch to iPhones and iPads. 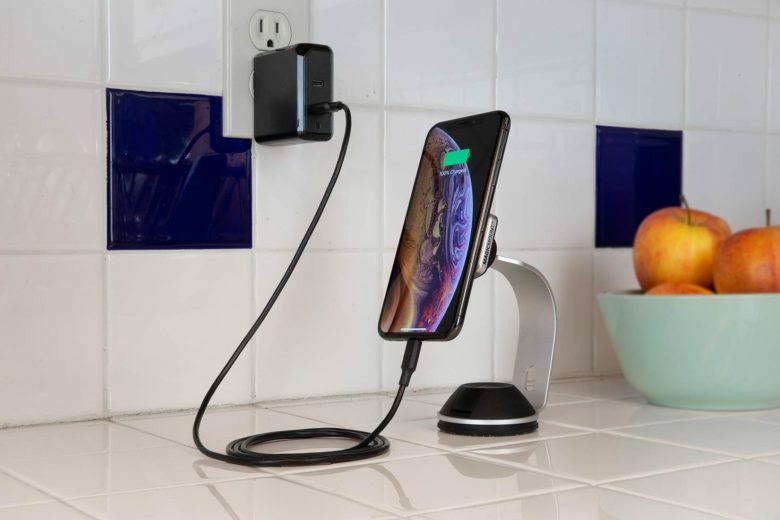 Pair the new StrikeLine cable with Scosche’s USB-C PowerVolt charger and get a fully charged iOS device three times faster than a regular charger. USB-C is the new industry standard and has been adopted by most hardware developers, including Apple, Microsoft, Dell, and Samsung. The cord delivers both power and data with a reversible connector. There are two durable styles, a Thermoplastic elastomers coating and a braided version in lengths of four and 10 feet. The braided version will be available at the end of April. However, a 4-foot Thermoplastic StrikeLine is ready for shipping on the Scosche website for $19.99. The PowerVolt charger is $29.99. Scosche has been around since 1980, starting with car audio products. They jumped in with tech accessories as mobile computing grew into a revolution. Scosche makes charging solutions, fitness trackers, device mounts for cars, headphones, and speakers.